Mozilla is planning another great improvement for Firefox browser on Windows 10, with the application to respect the theme enabled in the operating system. More precisely, Firefox will be able to adapt to the dark or light theme that users enabled in Windows 10, so the browser’s interface would align with the rest of the apps running on the OS. Mozilla offered a demo of this new feature on Twitter (also embedded below), showing that the visual style in the browser would change according to the settings made in Windows 10. 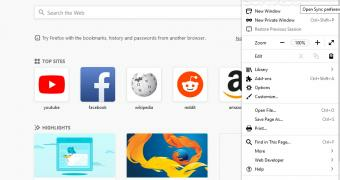 Custom themes won’t be altered and Firefox would retain its look in case such a visual style exists. “Firefox Nightly now respects the Windows 10 dark/light mode setting (If you’re already using a custom theme, don’t worry, we won’t change it),” Mozilla said.